The 555 timer integrated circuit is one of the oldest integrated circuits available. It has found huge popularity as a result of its versatility and ease of use. The 555 timer is used in most electronic circuits that require a timing function. These timing functions include generating a square wave or turning things on and off at a specific frequency and duty cycle (Pulse generation), activating a circuit after period of time has elapsed (Timing delay), as well as so many other functions. Everyday, people are always coming up with various fascinating uses of the 555 timer. Once you get a grasp of the operation of the 555 timer, you should be able to figure out different ways you can use the chip for your electronics circuit projects. Illustration of the NE555 timer showing the 8-pin Dual-in-line Integrated Circuit package and the pin out description. The 555 timer integrated circuit comes in different integrated circuit package types. The dual-in-line package type shown in the figure above is suitable for most circuits where through-hole components are to be used. The NE555 integrated circuit has 8 pins connections. These pins allow the 555 timer to be connected in a circuit to perform a desired function. Note the numbering system used to identify the pins. The pins are numbered in an anti-clockwise manner starting from the dot that identifies pin 1 of the integrated circuit. This is a common method of pin numbering for most integrated circuits. The 555 timer, like most other integrated circuits, is made up of several sub-circuits and components interconnected inside the integrated circuit package. Each of the sub-circuits performs a particular function. Often times, looking at the internal circuit or block diagram of an integrated circuit helps us understand the workings of an integrated circuit and how we can use them in our circuit projects. Lets take a look at the internal circuit diagram of the NE555 timer derived from the manufacturer’s datasheet. This will give us a better understanding of what function the individual pin connection of the 555 timer integrated circuit performs. Internal Circuit/Block Diagram of the 555 Timer. The internal circuit diagram of the 555 timer shows how simple the 555 timer is. External connections of every pin connecting to its corresponding sub circuit component is also shown. From the diagram, Pin 1 connects to power ground of your circuit project. The GROUND connection is the negative terminal of your power supply and is mostly at zero (0 ) Volt. Vcc should be connected to the positive terminal of the power supply. The 555 timer requires a supply voltage ranging from 4.5Volts to 16Volts. Anything higher than this will burn out the 555 timer. The output of the 555 timer (Pin 3) is driven by the ‘Output Stage’ circuit block. 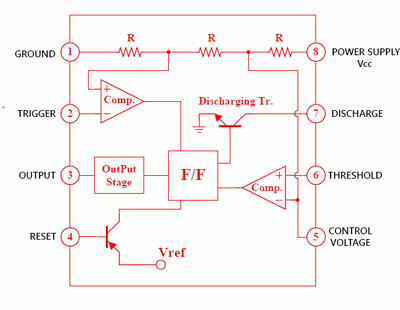 The Output Stage circuit block is a buffer that amplifies the output of the flipflop (F/F) for enhanced output drive capability. The output of the 555 timer is either HIGH or LOW. where HIGH stands for an output voltage level close to Vcc and LOW stands for an output voltage level close to 0 volts. This shows that a 555 timer has a digital output. The HIGH and LOW output voltage levels of the 555 timer is dependent on the power supply voltage. For a power supply voltage of 5v,HIGH and LOW output voltage levels are 3.3V and 0.3V. A voltage divider made up of three resistors of equal values (typically 5K Ohms) can be seen in the circuit diagram of the 555 timer. This voltage divider network has taps at two points. Voltages at these points are 1/3Vcc and 2/3Vcc. The taps on the voltage divider connect to terminals of two independent voltage comparators. A comparator compares voltages at its input and produces an output (HIGH or LOW) based on which of the input voltage is greater or lower than the other. A higher voltage at the non-inverting(+) input of a comparator compared to that on the inverting(-) input produces a HIGH at the output of the comparator while if the voltages at the inputs of the comparator is reversed, the output is a LOW. The first comparator has its non-inverting(+) input connected to the 1/3Vcc tap of the voltage divider while its inverting(-) input is connect to pin 2 which in this case is labelled ‘Trigger’. This means that the output of the comparator will go HIGH when the voltage on the inverting input (TRIGGER- Pin 2) is below 1/3Vcc, and LOW when the same Pin 2 voltage goes higher than 1/3Vcc. Each time the output of this comparator goes HIGH, the flipflop (F/F) is SET and the Output of the 555 timer goes HIGH. This in turn activates the DISCHARGE transistor which pulls the DISCHARGE pin 7 LOW. The second comparator’s inverting(-) input connects to tap 2/3Vcc of the voltage divider and also to an external pin (Pin 5) labelled ‘Control Voltage’ while its non-inverting(+) input connects to the ‘Threshold’ external pin; pin 6. This comparator’s output is driven HIGH when voltage on the Pin 6 (THRESHOLD) is higher than 2/3Vcc , and LOW when its below 2/3Vcc. When this comparators output goes HIGH, the flipflop is reset. this causes the output pin 3 of the 555 timer to go LOW. 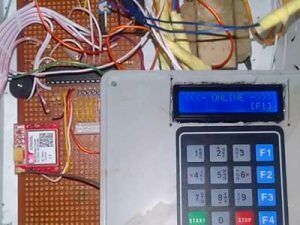 The RESET pin 4 forcefully drives the output of the 555 timer LOW whenever a LOW is applied to the pin. The control pin is used in some applications but when not in use, it should be connected to ground through a 0.1uf capacitor. The following sections demonstrate the use of the 555 timer in different circuits. You can easily assemble each circuit on a breadboard or a veroboard.